Truth be told, stellar characters need complexity no matter whose side they’re on. Authenticity, depth, a clear goal, an irrefutable lie, and obstacles make for exquisite layers that form a powerful, relatable, and realistic character. What Is a Character Arc and Why Are They Important? A character arc can best be described as the change in a character from the start of a story to the end of it. If a character gains redeemable traits throughout, their arc is considered positive, or one of growth. If there’s no change (which, when done right, will still result in changes from surrounding characters), the arc is considered flat. When good characters go bad, taking on negative traits, that change is considered a falling arc. As you’ll see in the article, the key is making the characters relatable—not necessarily likeable. For those of you who are familiar with my fiction books, you know I love writing unlikeable characters. Their stubborn personas draw me like a moth to a flame, and for whatever reason, creating them has become my little niche, so I proudly wear that badge. It’s challenging finding new ways to reach readers through darker characters though. One approach I use is taking a complex villain and having them change sides. I do the same with my protagonists. For one, it makes them more relatable. For two, just as in real life, good and evil isn’t always clear-cut. Things get a little muddied in the middle, causing character to cross lines they wouldn’t normally cross. Sometimes really good people make bad decisions, because we’re complex creatures and have the freedom to make choices. My favorite characters are ones who tread in the gray space, because you never know where they stand until it’s too late. I’ve found when characters hit rock bottom and are in a rut, especially mentally, one of two things will happen: They’ll either pull themselves out and change for the better, or they’ll go down the path of self-destruction. In my current work in progress, The Lost Souls, I have two characters who face such a dilemma. One is faced with extreme loss, and it forces her to take action, ultimately changing her for the better. The other has faced life-altering traumas as well, but he spirals out of control into a deeper pit of anger, revenge, and self-destruction. When it comes to character development, characters can change as much as people can (which now has me humming “Hot N Cold” by Katy Perry), and sometimes those changes result in positive character arcs—think Ebenezer Scrooge from A Christmas Carol or Hans Solo from Star Wars. Whether you’re dealing with a protagonist or an antagonist, combining complex traits with a transformative arc can yield captivating results, especially when those characters are less than likeable. 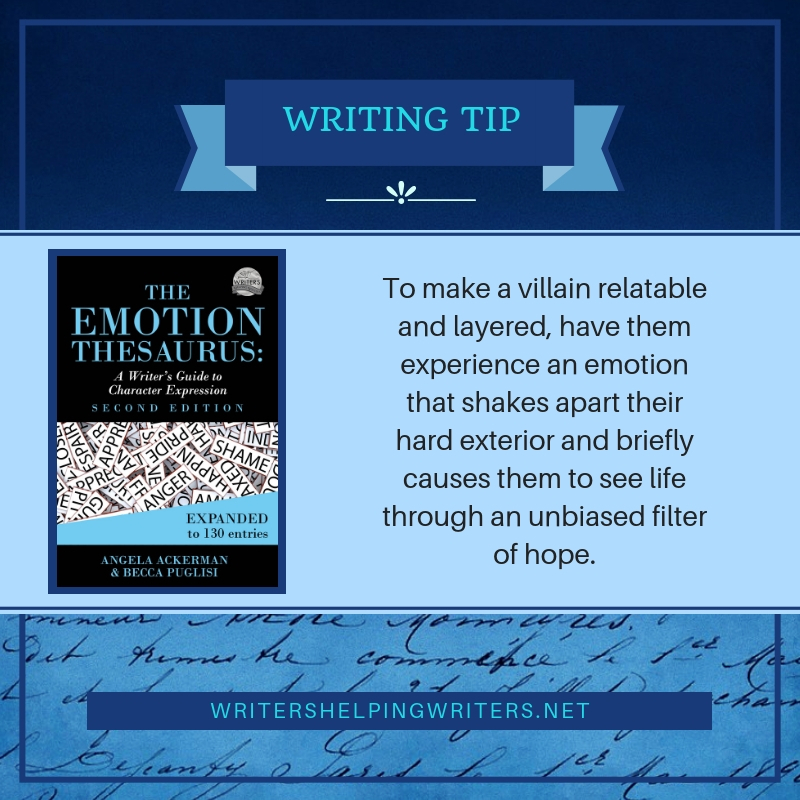 Last but not least, I’ll leave you with this stellar tip from Angela Ackerman and Becca Puglisi, authors of The Emotion Thesaurus series.